Have you ever noticed how great leaders are also depicted as great horsemen? Because I’m such a horse person my eye is drawn to the magnificent equestrian statues and sculptures of the great cities I visit in Europe. Also, as an artist myself, I know that accurately capturing the majesty, power and vulnerability of the horse is no mean feat. So, when I see equestrian artwork that resonates these characteristics I appreciate the artistry and vision required to effectively produce such a masterpiece. 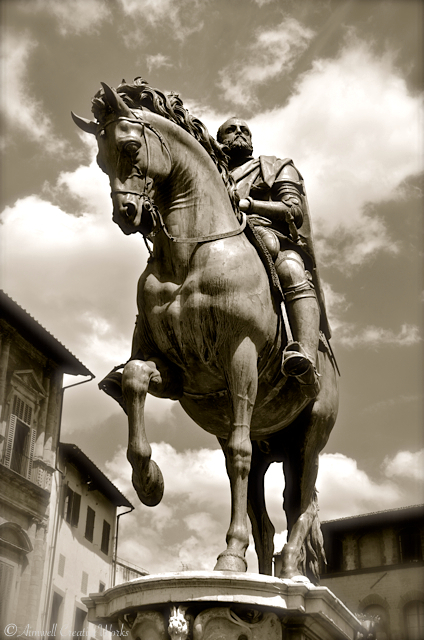 This entry was posted in Art, Equestrian, Italy, Photography, Travel and tagged Aimwell CreativeWorks, art, black and white, Dorothy Chiotti, Equestrian, Firenze, Italy, Leanne Cole, monochrome, Photography, Travel. Bookmark the permalink.